This is a formalized compilation of information I posted about in this blog post and this blog post. I figured I would turn it into an unofficial census of sorts. I plan to update it moving forward. 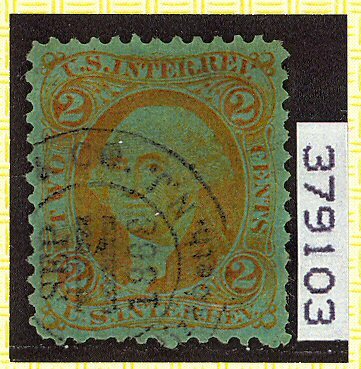 Scott R15e, 2-cent USIR orange on green paper, is a VERY tough stamp. 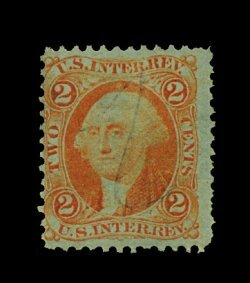 It only catalogs about double what an R6e (2-cent Bank Check on green paper) catalogs, but is much more scarce. I own two examples of R6e on document and have seen 3 others that I could have purchased. They will occasionally show up on eBay once every year or two. Neither Eric Jackson nor Richard Friedberg have had an R15e in stock for years. Eric says that he had one in 2008, and prior to that none since the 1990s. Richard says he has only handled one example in almost 40 years. He puts it at 5-10 times scarcer than the R6e. 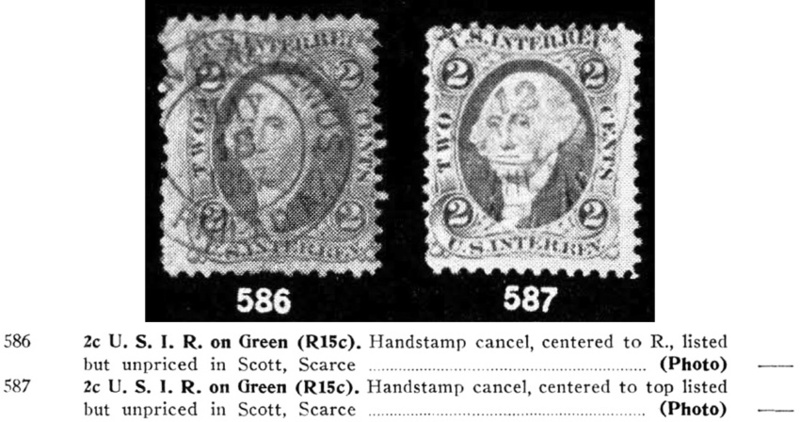 To give you an idea of the stamp's scarcity, the high-profile collections of Cunliffe, Tolman, and Joyce did not have any examples of R15e, despite the auctions having multiple examples of R6e (at least there were no R15e lotted as singles; I have no idea if there were any in the remainder lots). As an experiment, I decided to compile a quasi-census of R15e. If you are aware of any examples that I have not listed below, please contact me with the information. My thanks to Richard Friedberg for his assistance in compiling this list. I do not have access to a complete run of Aldrich auction catalogs, so there might be others that he offered, not to mention others offered by auction houses who don't have archives online or had high-profile revenue auctions. I contacted Michael Aldrich for his assistance in filling gaps but received no response. August 17, 2017. Kelleher auction 702. 2006 APS and 2017 Crowe certificates. February 2017. 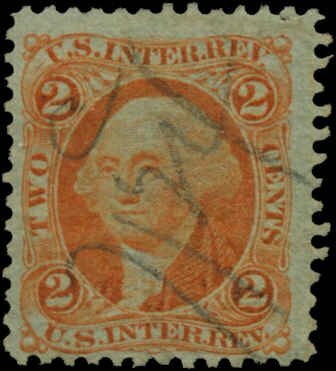 Found by me in a bulk lot, subsequently received a clean ceritifcate from the Philatelic Foundation, #544484. May 2014. Found by me in an eBay lot, subsequently received a clean certificate from the Philatelic Foundation, #521143. March 16, 2013. Currently in the collection of Bob Hohertz. October 24, 2012. Schuyler-Rumsey. The Bulkley Collection. Philatelic Foundation certificate #508668. July 21, 2010. Spink USA. Collector's Series. No cert. 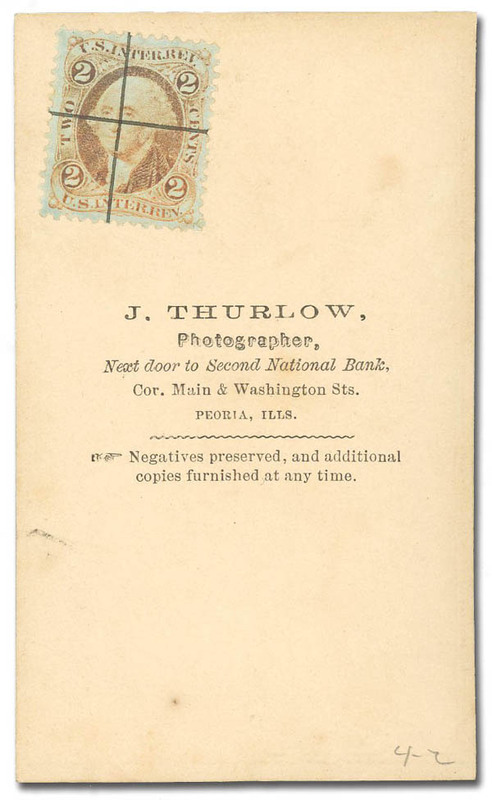 Did not sell or was withdrawn. October 19, 2002. Spink USA. Collector's Series. 1984 PF cert. Also Aldrich sale 25 in 1987. October 25, 2001. Spink USA. The William S. Floyd Collection. No certificate and no picture found. April 11, 2001. Siegel Auctions. 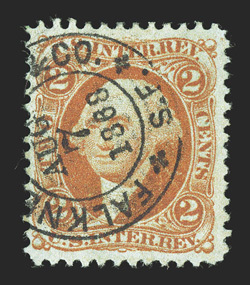 Sale 836. No cert. December 7, 1991 Michael Aldrich Auctions. Sale 34. 1991 PSE cert. May 25, 1986. Siegel Auctions. The Isleham Collection. No cert. October 12, 1983. Siegel Auctions. 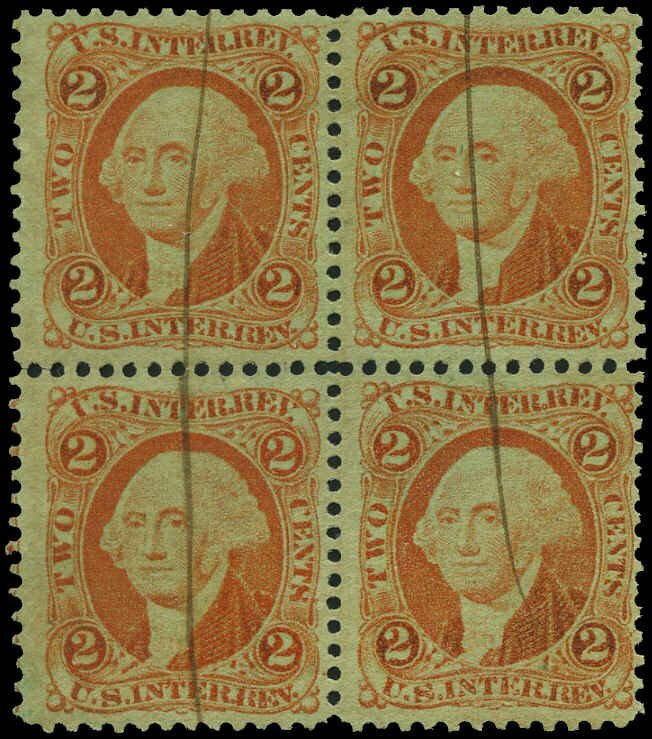 Sale 624. 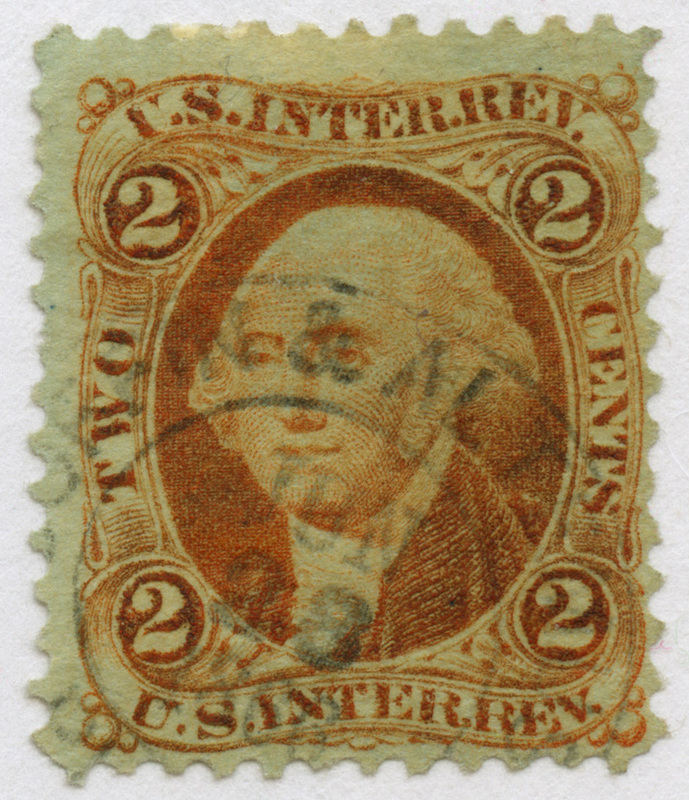 Two examples. No certs. October 18, 1979. H.R. Harmer. The Eastern Collection. No picture available. October 18-19, 1979. John W. Kaufman. Auction #58. 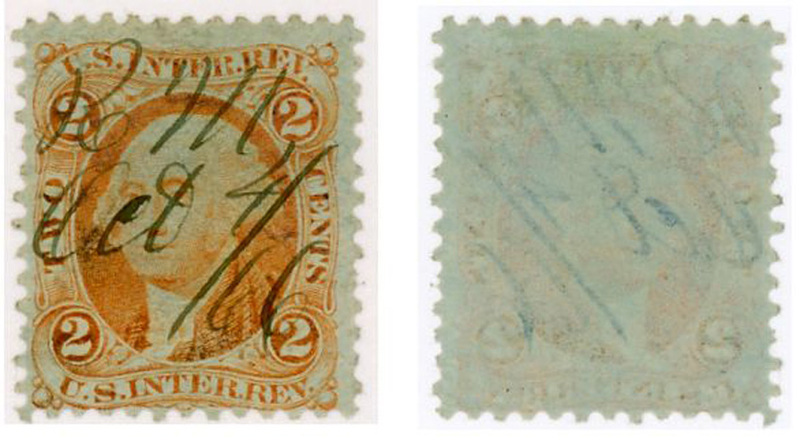 Two examples, neither with cert. March 3, 1970. Siegel Auctions. Sale 368. No cert. February 13, 1962. Siegel Auctions. 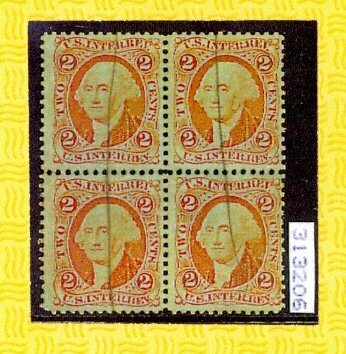 The Philip Little Collection of U.S. Revenue Stamps. Two examples, neither with cert. 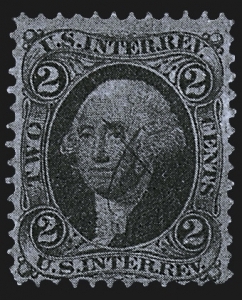 Second example received a negative opinion from the Philatelic Foundation. Unknown date. 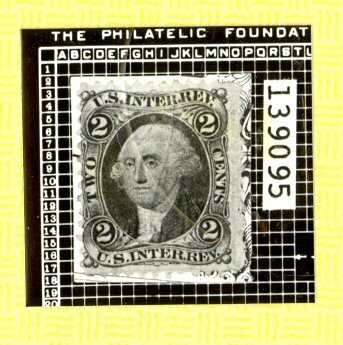 Philatelic Foundation certificate #379103. Unknown date. 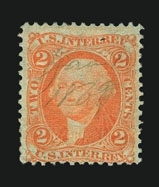 Philatelic Foundation certificate #313206. Subsequently overturned as "artificially tinted", certificate #507351. Unknown date. Philatelic Foundation certificate #139095.